During 1890 to 1892 several Italian men came to the Priest River area to work on the Great Northern Railroad. 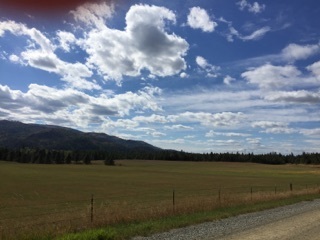 Shortly after arriving they found the area just east of Priest River was ideal for farming. The men sent for their wives, families and brides from Italy and started what is known as the Italian Settlement. Come to America to work on the railroad! The call went out to several foreign countries by the Northern Pacific Railroad and the Great Northern Railroad in the late 1890's. Many jumped at the chance to follow their dreams – the American Dream. Men from southern Italy took up the call to work on the Great Northern Railroad. A small group of men temporarily left their wives and families in Grimaldi, Italy to seek their fortune in northern Idaho arriving between 1880 and 1891. They worked as “gandy dancers” making railroad ties and laying track until 1892 when the Great Northern Railroad track through this Bonner County was completed. The valley east of Priest River reminded some of the men of their homes in Italy and they decided to settle here. The open land provided an ideal setting for small farms, growing hay and raising livestock. The men also found work in the timber industry – logging, mill work and river pigs. Several homesteaded land east of Priest River and it soon became known as the Italian Settlement which was shorted to The Settlement. Married men sent for their wives and single men sent for brides. The six Naccarato brothers, some of the first to arrive in the area, would build a cabin each year for one of the brothers. Once the home was completed, the owner would send to Italy for his wife and children. By 1900 the community grew with over 50 families living in the area. The community was close net, keeping the old traditions and language alive within its borders. Some of those traditions were growing plentiful gardens, raising pigs, making Italian sausage, and the craft of butchering. Charlie Naccarato built a big earthen oven where his wife, Marie Theresa, baked bread as she did in Italy. The community shared the use of this oven in the early 1900’s. The families built a school and church to bring the community together for school functions, weddings and picnics. While Italian was frequently spoken in the homes, the schools taught in English. 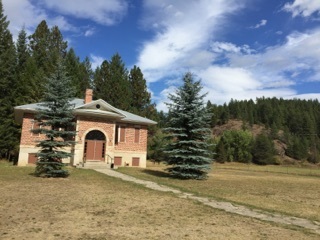 The school was consolidated with Priest River in 1939 and in 1951 St Anthony’s Mission Church was consolidated with the Catholic Church in Priest River. The church was torn down that year; however, the school is still used as a community center and is the host of the annual picnics in August. Like many of the small, rural communities, the Italian Settlement has slowly disappeared from its heyday. Farming and ranching was no longer profitable so families found work in other careers. Children grew up and moved away, land and homesteads were sold, and elders passed away. The Evergreen Cemetery stands in testament of the hundreds of hearty families that once made the settlement their home. Today rural homes are spread out over the community, but few are owned by the original descendants and little farming is done. The Italian Settlement will remain a part of the county history and a reminder of the ethnic diversity of Bonner County. Inside the Italian Settlement Church. 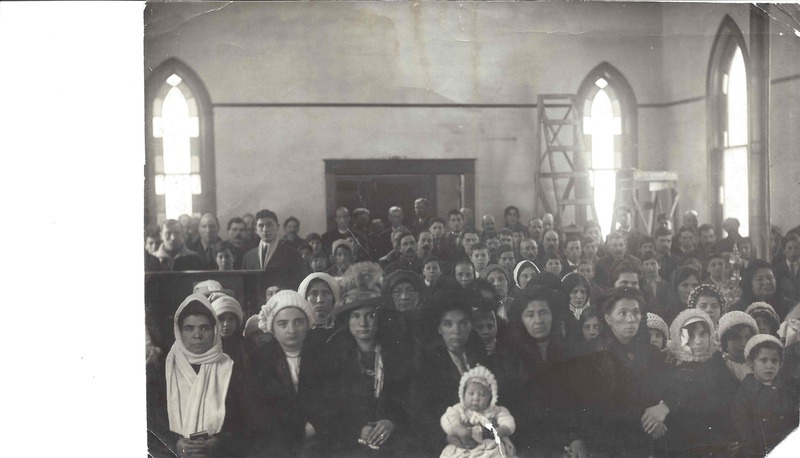 : Italian families in the church at the Italian Settlement. The picture does not indicate a date on the back; however, there were several physical descriptions of a two of the young men, Mr. Sam Pagnotta and Mr. Henry Naccarato. Courtesy of Jenny Bossio. The Naccarato brothers were among the first Italians to settle in the Priest River area. : The six Naccarato brothers were some of the earliest arrivals to north Idaho from Grimaldi, Italy. They came to work on the Great Northern Railroad and later became farmers and loggers. 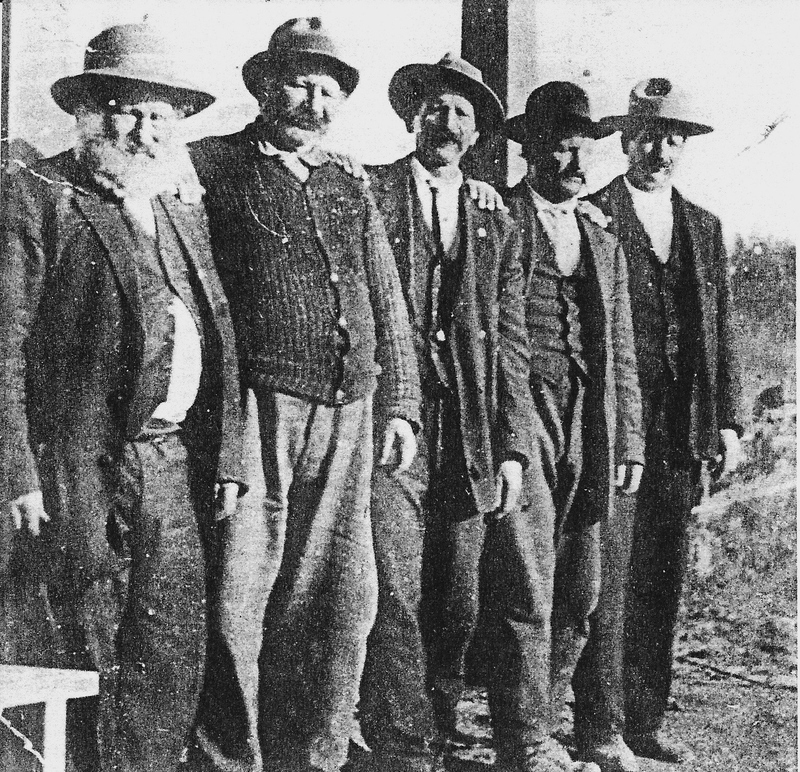 This picture of five of the brothers was taken about 1915. From left to right: Michael, Joseph, Charles, Frank and Antonio. Courtesy of Jenny Bossio. The landscape within the Italian Settlement consisted of large open fields with wooded sections. : The valley east of Priest River became known as the Italian Settlement. Much of the land is open fields where hay was grown and cattle run. Large gardens were planted near the homes to help feed the families. Now most of the land is vacant fields. Courtesy of Mary Garrison. The Settlement School : This is the second Settlement School. The first school was built in 1892 and the school district was known as “Little Italy”. In 1921 the school burned to the ground and was replaced by the new brick school in 1923. The school closed in 1939 and was renovated by the Knights of Columbus in 1997. Today it is used as a community center. Courtesy of Mary Garrison. Mary Garrison, “The Italian Settlement,” Spokane Historical, accessed April 20, 2019, https://spokanehistorical.org/items/show/575. 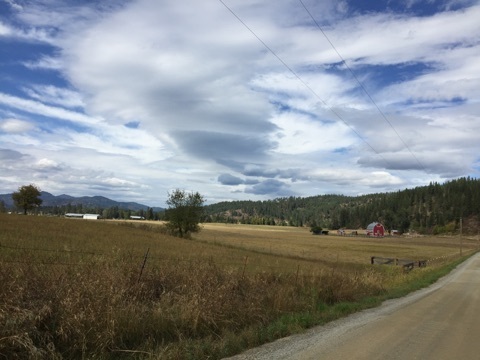 A rural community in Bonner County near Priest River where Italian immigrants settled. Cork, Marylyn. Beautiful Bonner: The History of Bonner County, Idaho (Curtis Media Corporation, 1991). Renk, Nancy Foster. Driving Past – Tours of Historical Sites in Bonner County, Idaho (Bonner County Historical Society, 2014).